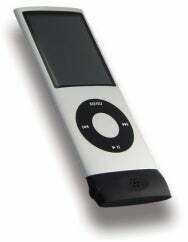 Most dockable iPods—including the third- and fourth-generation (4G) iPod nano and full-size iPods as far back as the third generation—let you use a third-party microphone accessory to record audio. The quality of these recordings can be surprisingly good, but if you’ve got a 4G nano, which costs as little as $149, you’re looking at spending a significant chunk of the price of the iPod itself—most iPod mics cost $50 to $70—for a microphone that’s bulky and ill-fitting when used with a nano. Once the Lloyd is connected, you use the nano’s built-in Voice Memos software to make and manage recordings; the Lloyd itself has no controls. The Lloyd’s pass-through headphone jack means you can actually leave the microphone connected to your nano all the time, but there are a few caveats. Because the Lloyd’s headphone jack is mounted on the side, rather than the bottom, some headphone plugs may jut out more than you like. And since there’s no pass-through dock-connector port, you’ll need to remove the Lloyd to sync your iPod with your computer. Finally, the Lloyd's headphone jack doesn’t pass remote-control signals from the inline remote found on Apple’s iPhone headphones and In-Ear Headphones with Remote and Mic. But the Lloyd shares some or all of these issues with every dock-connector microphone I've seen, and unlike those other mics, the Lloyd is so tiny you can disconnect it and carry it in the coin pocket of your jeans. Of course, small and inexpensive is great, but when you’re talking about a microphone, you don’t want to sacrifice recording quality for a low price. Thankfully, the Lloyd’s performance is quite good. While obviously designed for basic voice recordings—interviews, voice notes to yourself, and the like—during my testing with a normal speaking voice from a couple feet away, the Lloyd’s recordings were loud, clear, and natural-sounding. When I increased the recording distance to 4 feet, a normal speaking voice was still clear and understandable, if softer and a bit more hollow-sounding. The Lloyd is a standout iPod accessory: functional, affordable, and easy to use. If you're looking for an inexpensive way to take advantage of your iPod nano's voice-recording feature, the Lloyd is well-designed, it offers great performance for the price, and it’s compact enough to squeeze into the smallest of pockets. What’s not to like?